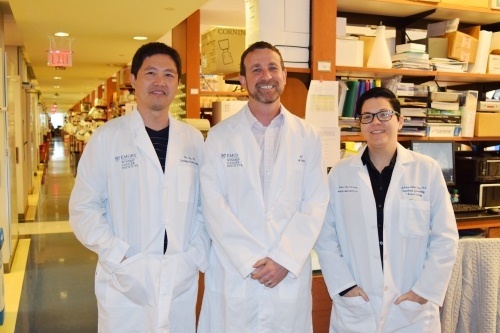 Adam Marcus, PhD, Wei Zhou, PhD and Melissa Gilbert-Ross, PhD are the three principal investigators of a new lung cancer grant from the National Cancer Institute totaling $2.5 million. The five-year award will allow the investigators to continue their work on targeted therapies for patients with LKB1-deficient lung adenocarcinoma. LKB1 is the third most commonly mutated gene in patients with non-small cell lung cancer. The goals of the award are to investigate downstream signaling pathways that may render LKB1-deficient lung adenocarcinoma susceptible to anti-metastatic therapy, and to identify specific mutations in LKB1 that are most vulnerable to this type of therapy. Other Winship investigators that will play a key role on the award are: Michael R. Rossi, PhD, Zhengjia Chen, PhD, Gabriel Sica, MD, PhD, and Madhusmita Behera, PhD.